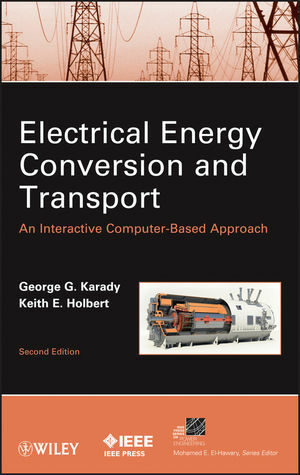 Designed to support interactive teaching and computer assisted self-learning, this second edition of Electrical Energy Conversion and Transport is thoroughly updated to address the recent environmental effects of electric power generation and transmission, which have become more important together with the deregulation of the industry. New content explores different power generation methods, including renewable energy generation (solar, wind, fuel cell) and includes new sections that discuss the upcoming Smart Grid and the distributed power generation using renewable energy generation, making the text essential reading material for students and practicing engineers. GEORGE G. KARADY received his doctorate in electrical engineering from the Budapest University of Technology and Economics in 1960. He also received an honorary doctorate from the Budapest University of Technology and Economics in 1996. He is currently the Chair Professor for the Salt River Project at Arizona State University. KEITH E. HOLBERT earned his PhD in nuclear engineering at the University of Tennessee. He is presently the Director of the Nuclear Power Generation program in the School of Electrical, Computer and Energy Engineering at Arizona State University. He is a registered professional engineer and a senior member of the IEEE.